King David established Jerusalem as capital of Israel more than 3,000 years ago. This week, the City of David paid tribute in the most incredible light an sound show at the Tower of David. Opened on 1 April, the “King David” nighttime sound-and-light show is powered by 18 high-definition laser projectors, 20 speakers and 10 kilometres of cable. 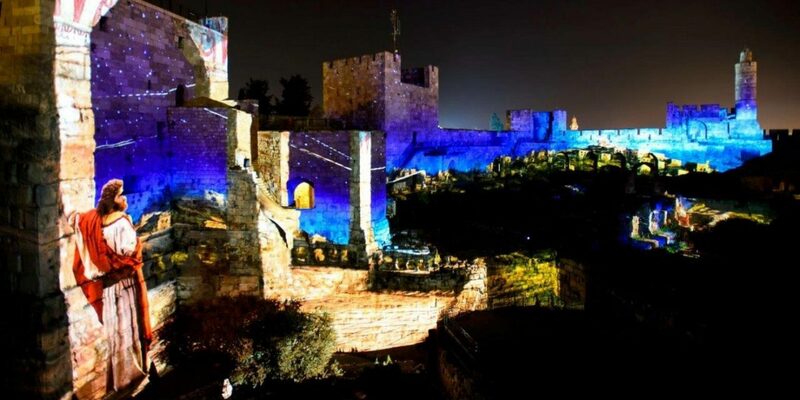 System designer Eli Geffen from Showlogix of Tel Aviv says it is the largest installation of 18,000-lumen single-chip M-Vision Laser projectors in the world, illuminating the citadel with 250,000 lumens and 35 million pixels. “The movement and the sharpness of the laser technology brings the subjects to life in three dimensions and makes the show that much more remarkable,” says archeologist Renee Sivan, the show’s concept creator and curator. The experience begins with a 15-minute pre-show amid the museum’s archaeological findings that bear witness to the history of Jerusalem, from the 13th century Crusader walls to the remains of King Herod’s palace from 2,000 years ago. The show opens with works of art inspired by the biblical account of David’s life from artists such as Rembrandt, Caravaggio, Matisse, Chagall and Michelangelo. The grand finale is an orchestral celebration of Psalm 122’s prayer for the peace of Jerusalem. The show’s original music score was composed by the French musician Alexandre Lévy, performed on 40 instruments and piped through a six-channel surround sound system. Artistic directors Jean-Michel Quesne and Hélène Richard from Collectif K2A, Paris, combined film, live actors, animation, art and illustration. The same duo is responsible for the “Night Spectacular” at the Tower of David (also conceived and curated by Sivan), a visual interpretation based on documented architectural changes of the city throughout its history. Some 2 million people have seen “Night Spectacular” over the past decade and it will continue to be shown along with “King David.” The shows run at least twice a night on Monday, Wednesday, Thursday and Saturday evenings depending on the season. Previous23 Palestinians killed… in SYRIA – where is the outcry?